Sun, Jan 20, 2019, 12:39 pm SL Time, ColomboPage News Desk, Sri Lanka. Jan 20, Colombo: Sri Lanka Navy has arrested four individuals who were attempting to illegally enter the country from the northern seas. Naval personnel attached to the Northern Naval Command and Coast Guard Fast Attack Craft, during routine patrol, intercepted two suspicious dinghies plying in northern seas and apprehended four persons aboard, the Navy Media Unit said. Having spotted two suspicious boat movements in the sea areas north and northwest of Kovilam Lighthouse, two Fast Attack Craft of the Navy and Coast Guard had been dispatched to the locations where suspicions boat movements were observed. Accordingly, four persons were taken into naval custody after having identified them as persons attempting to immigrate into the island, from India. 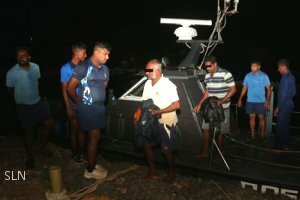 The men identified as Sri Lankan nationals were taken to the naval base, SLNS Uttara in Kankasanthurai were given first aid and necessary medical treatment by the Navy before they along with their dinghies were handed over to the Kankasanthurai Police for onward investigation.